We knew Samsung Galaxy S6 and Galaxy S6 Edge will be the most powerful Android smartphones available on the market since benchmark results of the latter leaked a few weeks ago. 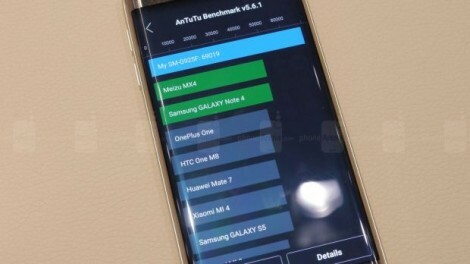 The previously leaked benchmarks showed Galaxy S6 Edge scored around 60k points, which put the the smartphone at the top of AnTuTu’s rankings when it comes to performance. Considering the unit tested was a prototype we were hoping the final build will be even more powerful, though the second most powerful smartphone on the market Meizu MX4 is far behind the Galaxy S6 Edge. Since both Galaxy S6 models have been announced, now is a good opportunity to see how much Samsung managed to further improve the smartphones. The folks over at PhoneArena had the chance to spend some time with the Galaxy S6 Edge and ran some tests on the smartphone. The results are impressive to say the least. Keep in mind that Samsung Galaxy S6 and Galaxy S6 Edge use the same hardware specification, so the benchmark results may apply to both smartphones. Long story short, once again, Galaxy S6 Edge’s benchmark results are off the charts. The smartphone managed to produced a score of 69K points in AnTuTu benchmark, almost 10K more than previous tests showed. On top of that, the smartphone used for running the benchmark is a pre-release version, so it’s not the final build. This means that there’s still room for improvement until the smartphones go on sale next month. It looks like Samsung’s proprietary Exynos 7420 octa-core chipset is a real beast when it comes to performance, but let’s hope it won’t be power hungry as well. Samsung Galaxy S6 and Galaxy S6 Edge will be released in 20 markets on April 10 and although the South Korean company did not announce any prices, we’ve been able to learn they will cost between €699 and €1049.